It's finally time for the next installment of Tea Pairing 101! This is the series Georgia, Jee, and I have been working diligently on, pairing interesting flavors together while making sure the ideas are easy to recreate at home. 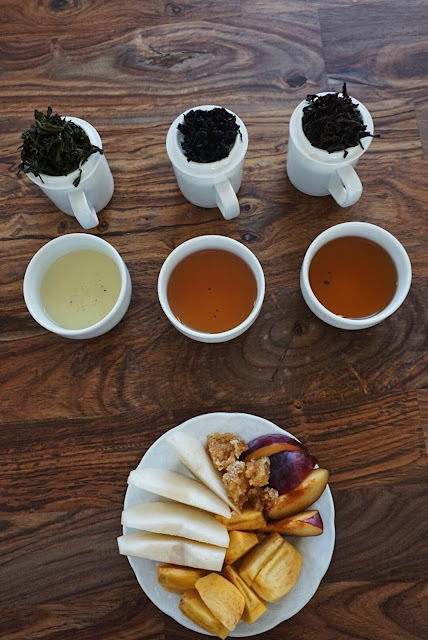 This time around we decided to pair oolongs with fruit. We wanted to use seasonal fruits, and since it is early autumn we chose pears, plums, and persimmons. All three of these fruits have very different flavor profiles, but still paint a picture of early autumn. We decided to include fresh honeycomb on our fruit plate to enhance flavors and appearance. We discovered the honey was a smart addition, which I'll explain later. We had the unique opportunity to have our pairing session in a super-swanky NYC apartment. 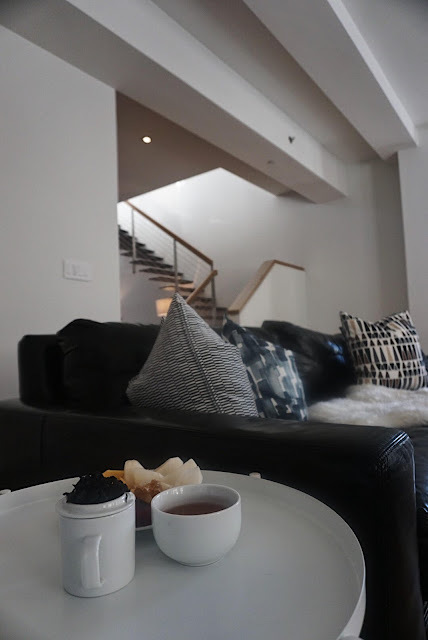 Thanks to Lizzie at Compass, we spent the afternoon at 286 Spring Street, a dreamy penthouse filled with natural light, modern fixtures, and terraces for days. 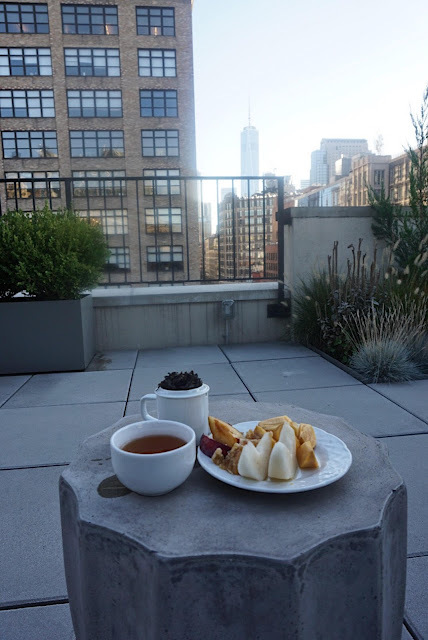 Quite an exclusive backdrop for enjoying tea and fruit. 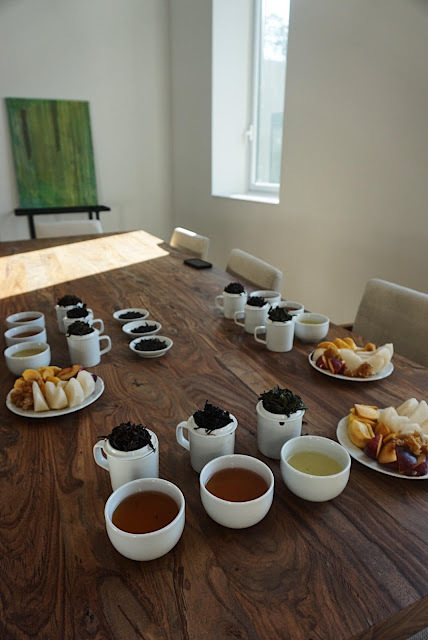 It wasn't easy to pick just three oolongs to use for this pairing. If you're an oolong drinker you know there are many different styles to choose from, and they have a wide range in flavor. Oolongs are typically produced in China, and Taiwan, but you can find oolongs from other tea growing areas. Should we pick a region? Stick with similar oxidation levels? What about roasting? 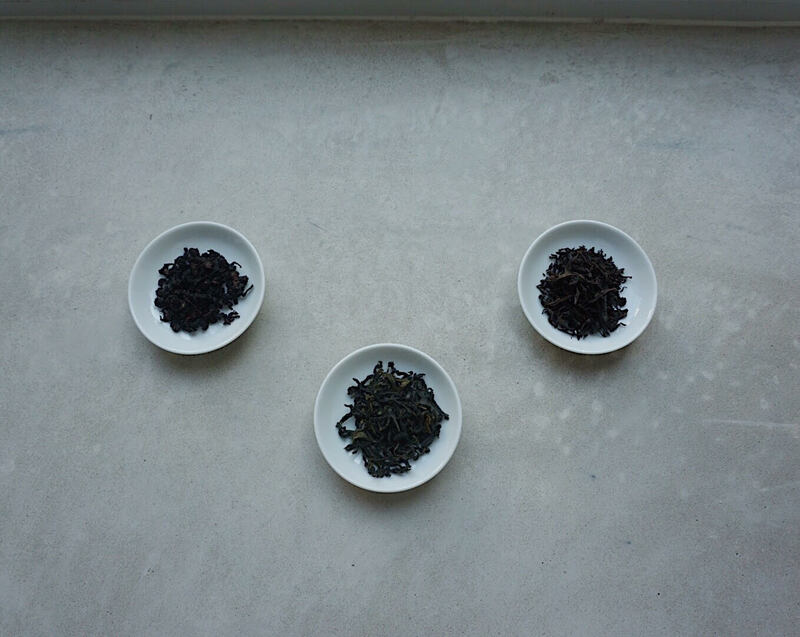 In the end we decided on three oolongs that are good examples of their style, and not difficult to find. The whole point is to enjoy the experience and not get stressed out about finding the most perfect thing. As before, we took three teas and paired with three foods. We used 3 grams of tea steeped for 2 minutes each in professional tasting cups. We nibbled some fruit then sipped the tea to see how the two worked together. Our first tea was Wenshan Bao Zhong (2017) by Tillerman Tea. This is a lightly oxidized tea from Taiwan. Bao Zhong means 'wrapped style' which is the rolling style reflected in the slightly twisted leaves. Quick story: the first time I had a beautifully floral Bao Zhong, it was purchased by my husband for me on our second date! We went to a tea store that called it Pouchong, another way it may be referred to. I remember it being beautifully floral but also vegetal, and the tea from Tillerman also has these qualities. The dry leaves have a dark military green color, with twisted inch-long leaves. The leaves have a needle-like shape. A floral aroma like a bouquet of fresh flowers emanates off of these leaves. After steeping the aroma is still floral, but vegetal notes are also sneaking in. The tea has many layers of flavor. It's savory, creamy, and floral. We tasted steamed bok choy and creamed spinach. This is a smooth, medium bodied tea without a hint of bitterness. A tea I could drink all afternoon. For the pairings, we had two options that could work. The pear was mild enough to accent the floral tea and also enhance the savory flavor. However, the pear didn't really add much to the experience. The plum turned out to be a better choice. Its sweetness worked well with the floral and savory notes, but didn't overpower the palate. The tart plum skin transformed the tea flavor, creating an interesting depth. The persimmon didn't work with this tea. The fruit was cloyingly sweet, and strangely the tea canceled out the flavor in the fruit. It was a peculiar experience, and not particularly appealing. The plum was the clear winner for me. The Tie Guan Yin (TGY) we used is from NYC's T-Shop. This is a heavily roasted TGY which is how I prefer to drink it, and is also the more traditional way to process the tea. I'm sure most of you have also had the lighter version of TGY, which is more floral and aromatic. The dry leaves are tightly rolled dark reddish brown pellets, which is characteristic for this type of tea. The leaves have an aroma of fresh walnuts and dried cherries, reminding me of lazy autumn picnics. The wet leaves present a roasty aroma, filled with chicory and dry twigs. It feels similar to kukicha in the dominance of that twiggy roasted goodness. The tea's flavor consists of chocolate, roast, and that chicory. A tea that reminds me of falling leaves and crisp mornings. Time for the fruit pairings. I was expecting the plum to work, mostly because it feels like an early fall fruit. My instinct wasn't correct. The plum didn't have much flavor when paired with this oolong. The tartness didn't combine with the roasty tea. The pear also didn't work well- it was just too bland for the tea. It didn't enhance, and it didn't compliment. The super-sweet persimmon actually worked beautifully with the tea. The cloying sweetness is rounded out by the earthy strength in the tea. The two contrasting flavors played off each other well, making a harmonious pairing. Winner! This tea is from Seven Cups. I'm sure you've heard of Big Red Robe (Da Hong Pao), the most famous Wuyi mountain oolong tea. Be sure to visit this page to learn about the processing of the Xiao Hong Pao. According to Seven Cups, the primary difference between Xiao Hong and Da Hong is in the special drying process that keeps the Xiao Hong from tasting too toasty. It allows for other flavors to come through, which is something we noticed more in the aroma than in the flavor of the tea. The dry leaves are dark brown and quite beautiful- long, twisted, and varying in size. The leaves have a rich chocolate aroma. Very sweet, a little bit of roast, and something a bit syrupy. Lots going on with this tea. After our infusion the wet leaves were still twisted, which made me think we could steep this tea many times before we really learn its secrets. The aroma of the wet leaves conjures up honey, dried fruit, and roasted butternut squash. Again, an autumn-appropriate tea! The brew tastes quite roasted with that chicory flavor we found in the TGY. It was a little bitter with a pleasing roundness and full body. I found this tea to be very comforting. It was interesting that the aroma was so sweet, but the tea itself was quite roasty. It's possible that we needed to play around with the temperature (we brewed the tea at 212º) and time, to get the brew just right. For the fruit: The persimmon worked nicely to tame the bitterness, but it didn't do too much for me. I think the flavors were polar opposites (very roasted, and very sweet), and perhaps they were too far apart to truly be a pleasant balance. We had a strange experience with the pear- it seemed to erase the flavor of the tea, but then a moment later the tea lingered on the palate. Jee decided that the pear was similar to a palate cleanser, which was an interesting thought! The plum turned out to be our goldilocks- it created a nicely balanced flavor with the roasted tea. Sweet and tart worked well with the rich, roasted tea. One of the important things we learned in this pairing is that the level of sweetness really makes a difference. The semi-sweet plum paired very differently than cavity-inducing persimmon. Making sure the fruit is ripe and in-season is also key. Fruit that is at the peak of flavor will pair very differently than unripe, bland fruit. The texture also influences the way the flavors feel on the palate. Since the flavor and texture can be unpredictable, it's important to taste all of your fruit to make sure it's how you imagined it would be. Pairings don't need to be limited to flavor profiles (plums with a tea that reminds you of tart plum skin, for example), but consider seasons. Teas that are picked in the same season as the fruit are an interesting study, or try to intentionally contrast the seasons and see how it changes things up. Remember the honey I mentioned earlier? Honey turned out to be a unifying factor on the fruit plate. The honey always linked the tea and fruit together, and seemed to enhance the flavors. So, if you are using fruit that's perhaps a little out of season or not ripe enough, adding a little honey will work wonders. The pairing doesn't work quite so well? Try adding a little drizzle of honey. I don't think honey should be relied on to make the pairings work, but it is certainly a delicious way to harmonize flavors. It's also important to remember that there are no right or wrong answers here. If you prefer a different flavor combination, great! Go with what you like. I hope you enjoyed our swanky paring adventure, we certainly did! Don't forget to check out what Georgia and Jee had to say. You can read about our last two previous pairings here and here. 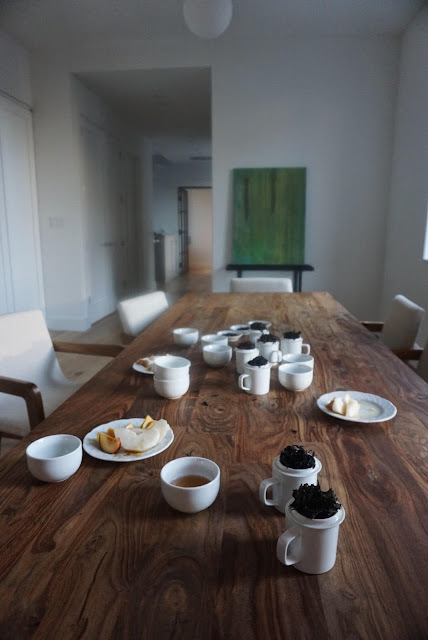 Stay tuned, we'll be brainstorming another Tea Pairing 101 soon. Money shot of One WTC! Can't wait for black tea time! Found your comments (and those of Jee and Georgia) fascinating, and thought I would present the science behind all your astute observations. Excellent work, all of you, and thanks so much for sharing! My book "Three Basic Teas & How to Enjoy Them" at Amazon, now in Kindle and paperback versions! Thanks so much Virginia! I'm off to read your blog post!! These pairings sound like a nice thing to try when I want to enhance my tea experience next time. I wonder how would I pair a fruit tea.I guess not with fruits but something savoury maybe.